If you're an athlete, you may find it's tough to lose weight. You're already more active than the average person, so increasing physical activity probably doesn't represent an option for weight loss. Instead, you'll need to lose weight by changing what you eat. A meal plan to lose weight for athletes should reduce fat in the diet and include plenty of high-fiber carbohydrates. Talk to a sports scientist or medical professional to figure out a calorie intake that facilitates weight loss, and meet your calorie needs with healthful foods that will support your training program. To lose weight, trim some fat from your diet -- athletes who eat a lower-fat diet see more weight-loss success, according to the University of Northern Iowa Sports Science Exchange. For breakfast, consume low-fat milk over high-fiber, low-fat cereal, preferably covered with fresh fruit. Avoid granola cereals -- most have too high a fat content. If you want something more to start your day, try toasted whole grain bread topped with fruit juice-sweetened jam. Athletes need more protein than most people to perform well and rebuild their muscles in between training sessions. As part of your meal plan to lose weight, your lunches should include some lean protein, plus plenty of complex carbohydrates to provide energy for your workouts. Try a large salad with lettuce, chopped tomatoes, peppers and radishes, topped with smoked chicken breast and drizzled with a bit of olive oil. A cracked whole wheat roll on the side can provide some additional carbs and fiber -- just make sure to skip the butter. Alternatively, you could enjoy a hearty turkey sandwich with lettuce and tomato on whole grain bread, along with some sliced apples and carrots on the side. Dress your sandwich with mustard instead of mayonnaise to keep the fat content low. 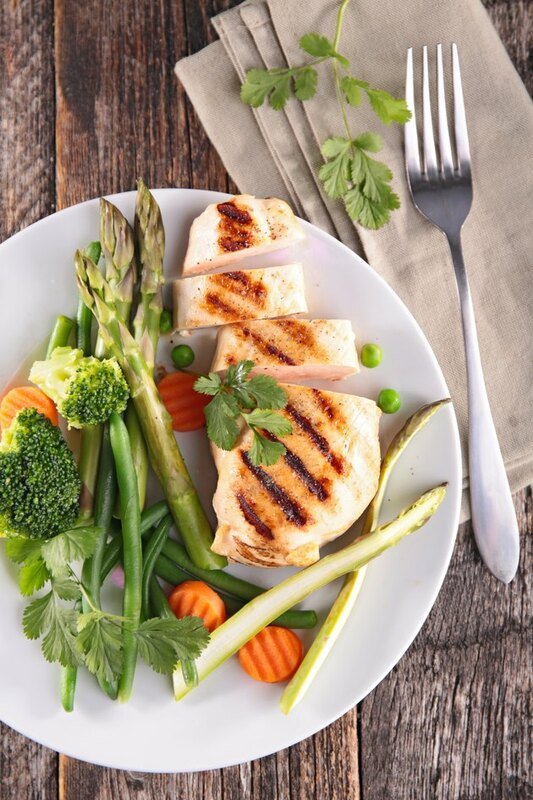 For dinner on your athlete's meal plan to lose weight, you should make sure to get some additional protein -- in fact, athletes who eat a little more protein tend to lose more weight, according to the University of Northern Iowa Sports Science Exchange. However, the protein you eat still needs to contain little fat. Try some fish broiled with lemon and pepper -- cod and tilapia both represent low-fat, healthy choices. Steam some asparagus or broccoli, and add some brown rice on the side for fiber and additional whole-grain carbs. If you don't like fish, try a lean chicken breast baked with fresh herbs, possibly with a sweet potato and and carrots on the side. For dessert, keep it light and fat-free -- you can enjoy a bowl of fresh fruit or a small scoop of fat-free sorbet. As an athlete, you need to make sure you don't lose weight too fast, or your athletic performance could suffer. Try to cut no more than 500 calories a day from your diet, according to the University of Arizona. Don't skip meals to lose weight; instead, eat smaller amounts at every meal and snack on low-calorie, high-carbohydrate foods frequently throughout the day to fuel your workouts and keep yourself from getting hungry. Eating your meals more slowly may help you feel full consuming fewer calories.